But those, while great, are not the thing I like best. What I like best about Sci Phi Journal is: the opportunity it has granted to some young up and coming authors, like Josh Young, Brian Niemeyer, and Ben Zwychy (Look! Not a single vowel! Cool name, eh?) There are not many venues today that are open to launching new writers. 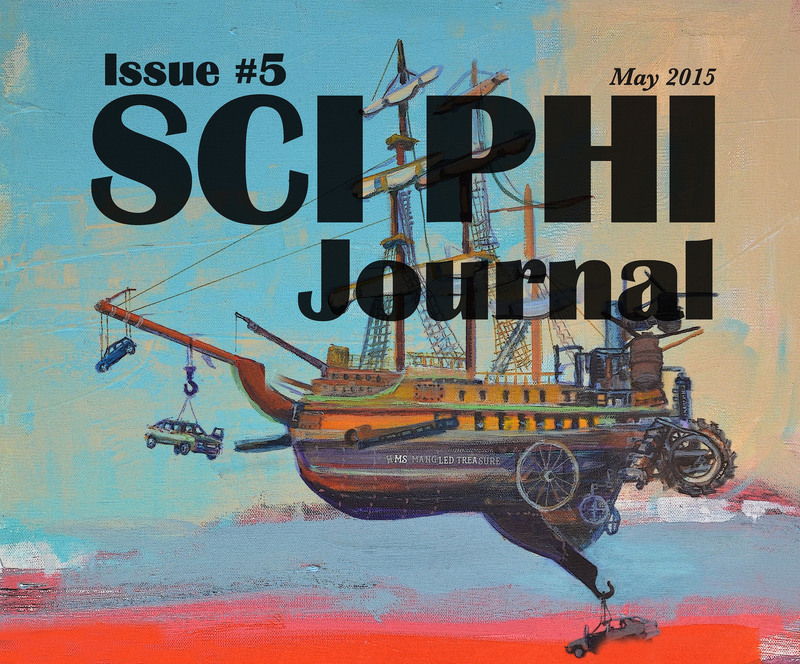 Sci Phi Journal, however, was devoted to choosing stories based on merit, whether the author was old and established or young and new. “Pirates, you say?” asked the detective who stood on Clara’s front stoop. At least Clara thought he was a detective, since he wore a fedora and a trench coat and looked disturbingly like a Humphrey Bogart clone. He could have been the claims adjuster, however. She had talked to so many people, she had lost track. Usually, this was the place where they shot her the “you should be locked away” look. This guy just nodded calmly, like he was on the set of Dragnet or something. Cool as a cucumber, he was. “Pirates towed your car, Ma’am. Is that right?” he asked again. He spoke with a Bronx drawl, so that his “that” sounded like “dat”. Clara had never heard a Bronx accent in real life. She kept expecting him to drop it and talk like a real human being. Clara sighed. It felt good to have someone believe her for a change. It had been a while since anyone had believed her about anything. Still, it took all the fight out of her. “Any idea who’s behind it?” she asked as nicely as she was able. Just great. It would be that the guy who finally believed her was three crayons short of a box. Clara she cocked her head and fixed him with the look that her miserable excuse of an ex used to call the Hairy Eye. The detective met her gaze square on, completely unfazed by the Hairy Eye. That in itself was amazing. Clara frowned. The guy seemed calm and reasonable. Not what she expected from a crazy, but then she had been an ER doc, not a psychiatrist. Maybe real crazies were as cool as cucumbers. It would certainly explain why he dressed and talked as if he had walked out of a 1940s movie. “Look here, Mr. Spade-wanna-be. Pirates is one thing…” Clara froze, her mouth wide open, because at that moment, she remembered something. A terrible sensation spread through her body, much like what she imagined it might feel like to be stung by scorpions. Tears pricked threateningly at her eyes. She let out a low warble of a moan. “Is that your dog, Ma’am?” the detective asked. Clara shook her head, nearly whipping him with her cornrows. Next time, she would stand a little closer and wap him good. And rightfully so! That was my inspiration. In the first version of the story, back in 2008, the pirates sang that song. But the original editor thought it wasn't in the right mood and the story was too long, so I cut it. Yes, this comment is not timely. I wonder if you or your friend Anna Hall (presumably with an autistic grandson) ever heard of Jonathan Mitchell and his science fiction novel The Mu Rhythm Bluff? The author suffers from autism as does the main character in the novel; it is a story about autism told from the point of view of an autism sufferer and in my opinion it is excellent but probably not superversive. I would include a link but I tried to do that a few minutes ago and my comment was deleted as spam. Re: Yes, this comment is not timely. Sorry about the spam thing. I have not heard about it. Thank you. I am so glad that you enjoyed the story. It was very difficult to write, and I have always been a little sad that no one has seemed to notice it. You are one of the first people ever to comment on it.